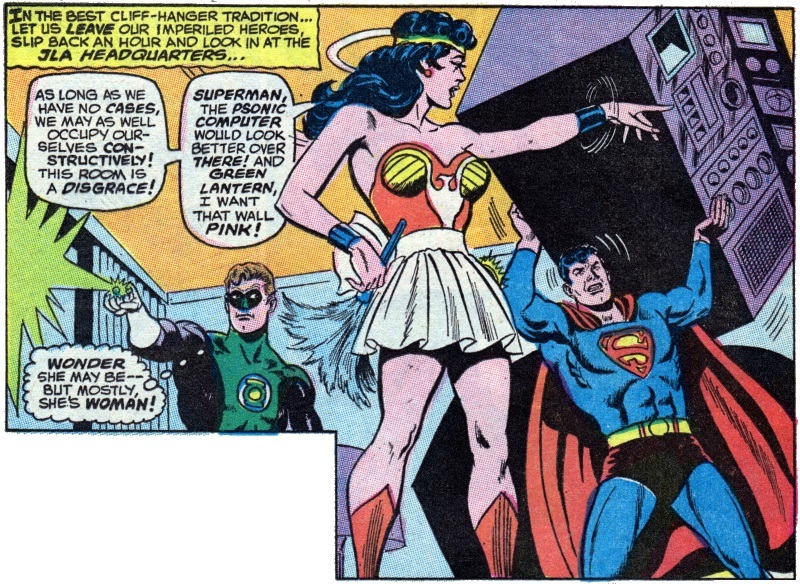 Ah, casual sexism in the 1960s, from Justice League of America #66. Where else would you see one of the most powerful and iconic female heroes reduced to a home organising shrew complete with apron and feather duster? As an aside, what the hell is a “psonic computer“? Posted on Thursday, February 1, 2018 Monday, October 15, 2018 by GaryPosted in UncategorizedTagged Green Lantern (Hal Jordan), Superman, The 60s, Wonder Woman. Next Next post: The Original Power Girl Returns? Hal’s comments aren’t really that shocking. I mean he’s pretty had the same attitude from then until now. That apron doesn’t help her cause though. I’m guessing the Amazons were the one who REALLY invented the concept of Fung-shui then….